Cut potatoes in 3/8 inch thick slices. Rinse in cold water. Dry with paper towel. Put in bowl. Add some olive oil and mix with hand. Line baking sheet w/foil and place potatoes on i single layer. Can sprinkle w/more salt if desired. Bake 425° turning every 15 minutes until done. Preheat an oven to 350 degrees F (175 degrees C). Butter a large baking dish. Wash and peel the potatoes so that only some of the peel remains on the potatoes; cut into 1/8 inch slices. Put the potatoes in the prepared dish. Melt the butter in a large pot over medium-high heat. Cook the onion and garlic in the melted butter until soft and translucent, 7 to 10 minutes; stir in the broccoli soup, celery soup, milk, salt, pepper, and about half of the Cheddar cheese; cook until the cheese has melted. 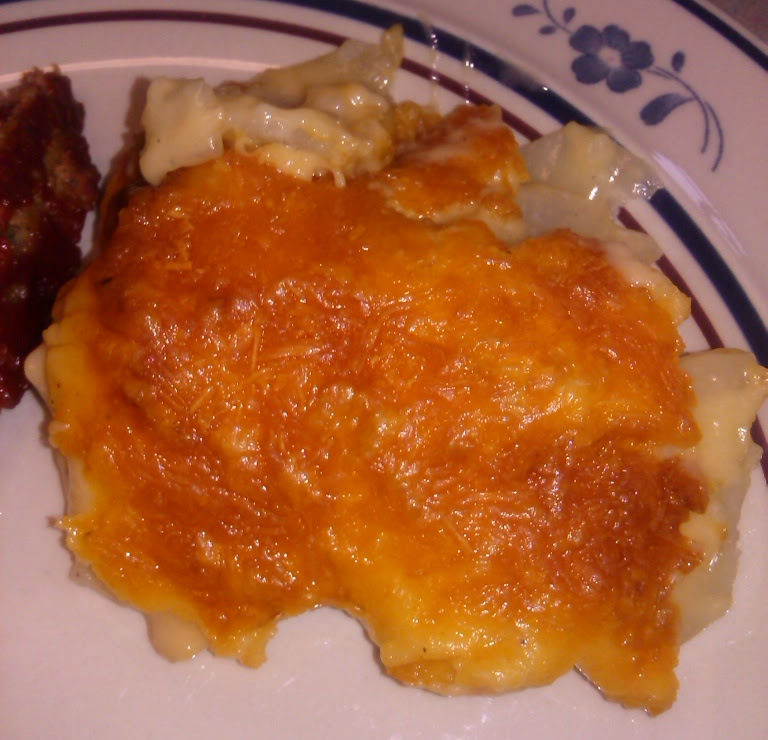 Pour the mixture over the potatoes; top with the remaining Cheddar cheese. Cover with aluminum foil or lid. Bake in the preheated oven for 45 minutes. Remove the cover and cook until the cheese begins to brown, about 10 minutes more. Mix together first 7 ingredients. Put in greased 9 x 15 pan. In separate bowl, mix together last 2 ingredients and spread over potato mix. Bake 350° for 1 hour. Combine oil, garlic and rosemary in a 2 qt. microwave-safe baking dish with a lid. Cover and microwave on high until garlic is fragrant, 1 minute. Stir in potatoes. Cover and microwave on high until potatoes are tender, 13 to 15 minutes. Season with salt and pepper. Bake 375° for 1 hour. Bake 350° in oven for 1 hour, covered or can put in crockpot. 1 can pork and beans (30 oz.) ? Brown hamburger and onions. Drain. Add other ingredients and simmer. Combine caraway, rind, pepper, 1/8 tsp. salt, turmeric, and butter in a small bowl. Chill 5 minutes or until slightly firm. Remove outer leaves of cabbage; discard. Cut cabbage vertically into quarters; cut each quarter in half to equal 8 wedges ( leave core intact). Brush cabbage wedges evenly with oil. Heat a large skillet over medium. Coat pan with cooking spray. Add cabbage wedges to pan; cook 3 minutes on each side or until browned. Arrange cabbage wedges, cut sides up, on a baking sheet. Spread half of butter mixture evenly over cut sides of cabbage. Bake at 350° for 25 minutes. Remove pan from oven; spread remaining half of butter mixture over wedges. Bake at 350° for 20 minutes or until tender. Sprinkle with remaining 1/4 tsp. salt and dill. Serve immediately. Bring carrots and enough water to cover to a boil in a saucepan. Reduce heat to medium-high and simmer, stirring occasionally, until carrots are tender, about 10 minutes. Drain. Melt butter in a 10-inch skillet over medium heat; stir in honey, lemon juice, and ginger. Increase heat to medium-high, then stir in carrots until well coated. Cook, stirring occasionally, until thickened, about 5 minutes.